Incredibly delicious Brown Butter Oatmeal Crumb Apple Pie! Everyone will beg you for this recipe. Hello and Happy Saturday! 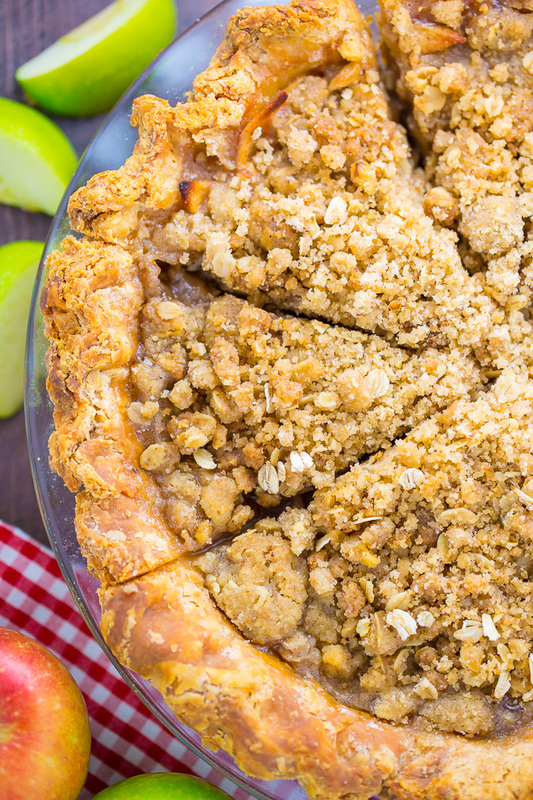 Here’s another recipe from my Summer baking bucket list: Brown Butter Oatmeal Crumb Apple Pie! ← Try saying that 5 times fast. I know apple pie is synonymous with Fall baking (and the holidays!!! ), but I just couldn’t resist sharing this beauty with you NOW. Also couldn’t resist topping my slice with a giant scoop of homemade vanilla bean! As a treat for reading this far, I’m going to let you in on a juicy little secret: I wrote a book! And it’s ALL about pies! I should clarify it’s an e-book, but in my opinion that makes it even more awesome. I don’t know about you but my book shelves are pretty low on space for new arrivals! I’m releasing it this October and couldn’t be more excited to share it with you. 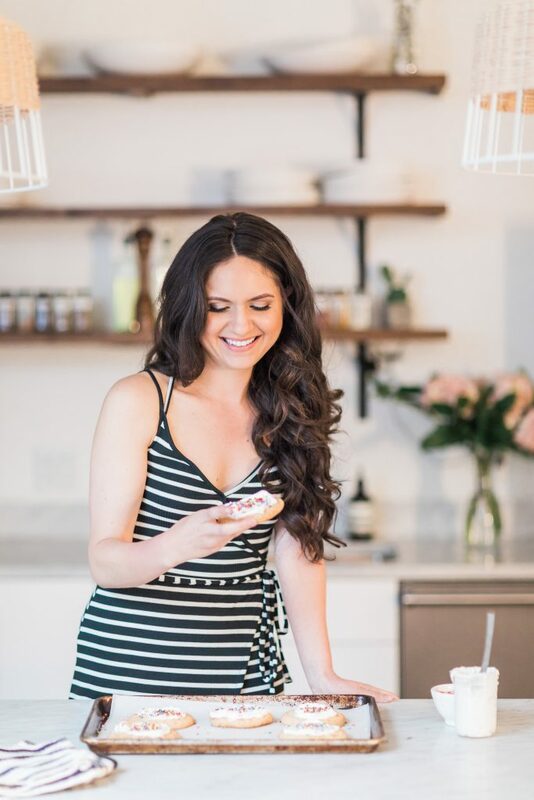 I’ll have more delicious details for you SOON! 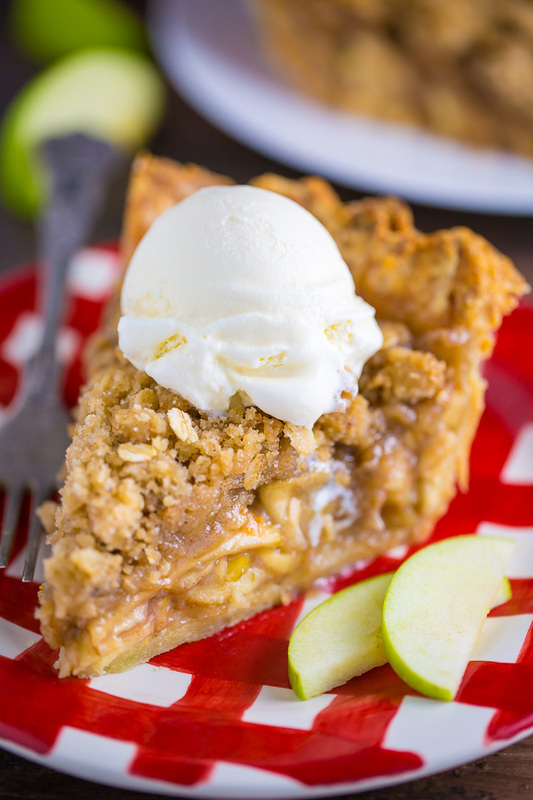 But for now, let’s focus all of our attention on this epic brown butter oatmeal crumb apple pie! 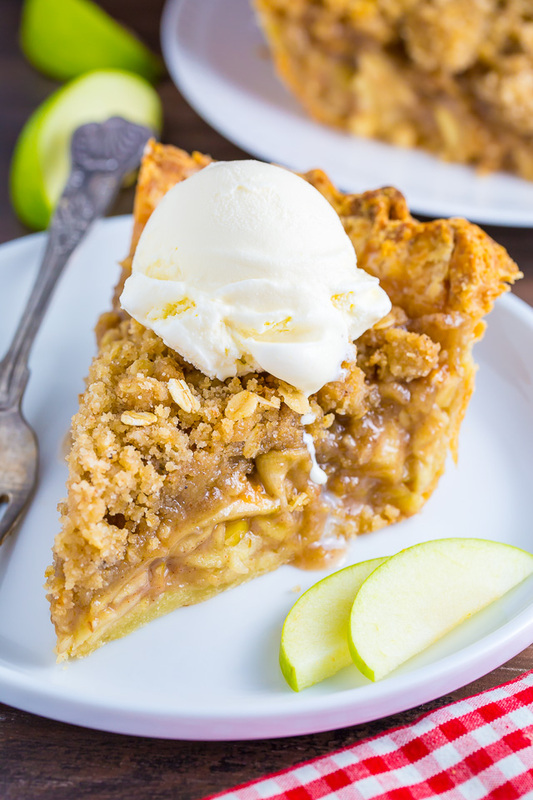 This pie features a super flaky all-butter crust, a melt-in-your-mouth oatmeal crumb topping, and a sweet apple filling. Each bite is pure nirvana! Make your pie crust ahead of time! You can actually do this step up to two months in advance, since pie crusts freeze great. If you’d like to make it the day of, be sure you plan in advance and have plenty of time. The crust needs to chill for at least an hour before being rolled out, and then another 30 minutes before being filled. For the best results, I suggest making your crumb topping in advance and chilling it in the fridge (or freezer) until needed. You don’t want it rock hard, but chilling it allows the mixing to firm up, which helps it keep its shape while baking. If you’re concerned about over-browning, you can place a piece of tin foil over the pie during the last 15 minutes of baking. Be sure to allow your pie to cool for at least 6 hours before slicing! If you attempt to slice it still warm the filling will leak and ooze everywhere. It takes a full 6 hours for it to set and slice like you see in my photos. If you prefer warm apple pie, you can heat your cooled slice in the microwave for a few seconds. Works like a charm! Homemade Brown Butter Oatmeal Crumb Apple Pie! A must bake for the holidays! Mix flour, sugar, and salt in a food processor or blender. Add butter and pulse until a coarse meal forms. Be sure not to pulse too long, the butter should be no smaller than the size of peas. Slowly add in just enough ice water to form moist clumps. Gather the dough into a ball and divide in half (you can use a kitchen scale if you want them to be perfectly even). Form dough into 2 balls and gently flatten into disks. 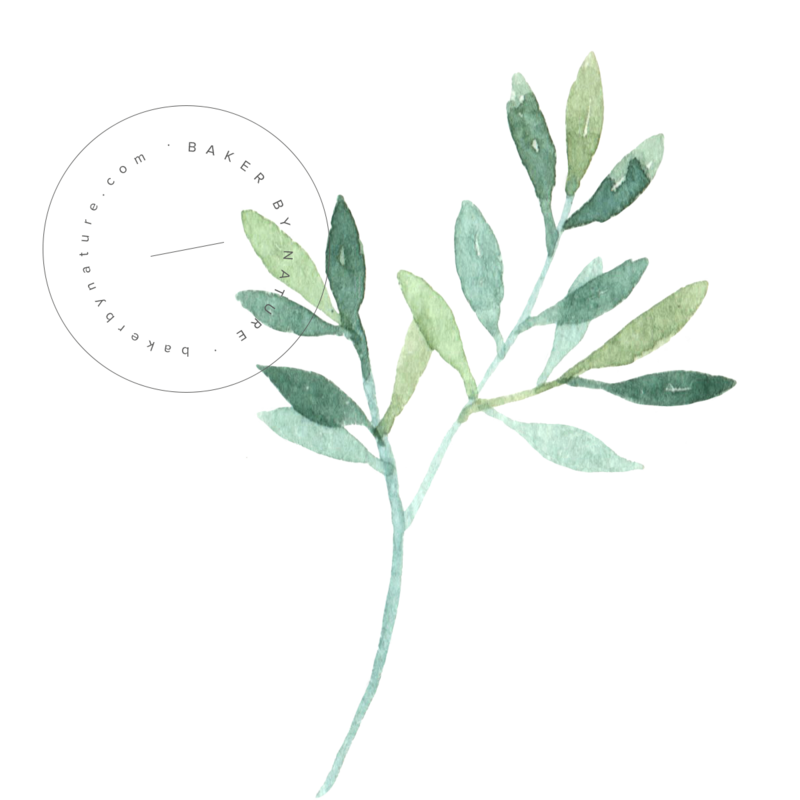 Wrap each disk in plastic and place in the refrigerator to chill for at least one hour. You will only need one dish of dough for this recipe, so you may want to place the other disk in the freezer until needed. In a large bowl combine both sugars, flour, oats, and pecans; mix well to combine then stir in browned butter. 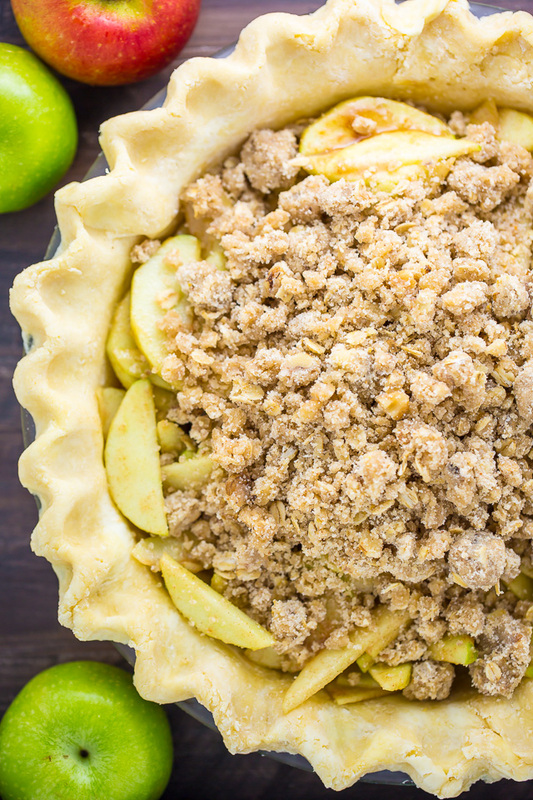 Place the crumb topping in the fridge or freezer while you assemble the apple pie filling. 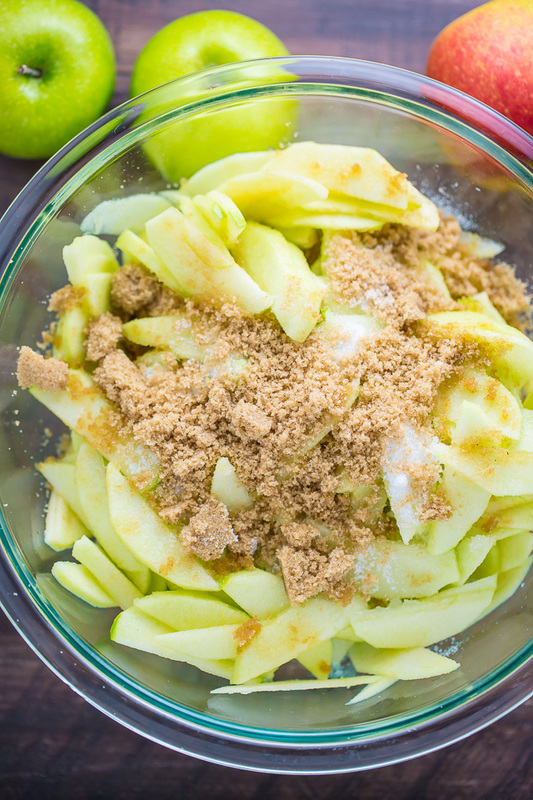 In a large bowl toss apple slices with apple cider vinegar and vanilla, set aside. In a separate bowl add both sugars, cinnamon, nutmeg, and cornstarch and mix well to combine. Add the dry mixture to the apple mixture and toss to coat. Preheat oven to 375 degrees (F). Lightly grease a 9" pie plate with non-stick spray OR butter and a little flour; set aside. Roll out half of the chilled dough on a lightly floured work surface, rolling it to about a 12-inch round. Gently place the dough into the prepared pie dish and trim the edges OR crimp them decoratively. Sprinkle the bottom of the pie shell with 1 teaspoon of flour (this helps soak up excess moisture) then add the apple filling. Add half of the frozen crumble on top of the apple filling, then place the pie in the oven – on the middle rack – and bake for 30 minutes. Reduce oven temperature to 350 degrees (F), rotate pie, and add the remaining crumble. Bake for another 30 to 35 minutes, or until the crust and crumble are golden. Carefully remove pie from oven and cool it on a wire rack for at least 6 hours before cutting. omg everything looks sooo good!!!! I have a bumper crop of apples from my tree this year. I was looking for a unique apple pie receipe. This was fabulous! I didn’t have time to make the crust from scratch but will do the next time I make it. This recipe is a keeper! I’m so happy you enjoyed it, Velvet! What about freezing this pie? Hi Melissa. I’ve never tried freezing this pie, but don’t think it would hold up well due to the crumb topping, which may become soggy if frozen and reheated. I’ll take a photo of my cute apple pie and mention you . What is the point of the apple cider vinegar in the pie filling? I’ve never seen a recipe that had vinegar of any kind in the apple filling. I was going to make this but I don’t want to ruin my apples without finding out why vinegar is called for. So I made this the other day and one question – why don’t you use your Foolproof All Butter Pie Crust for this recipe? The crumb topping for this pie tasted wonderful, but once cooked it was a bit messy to eat- it didn’t actually stick together very well (I followed directions exactly here including putting the topping in the fridge).. I also thought the apples were too tart. 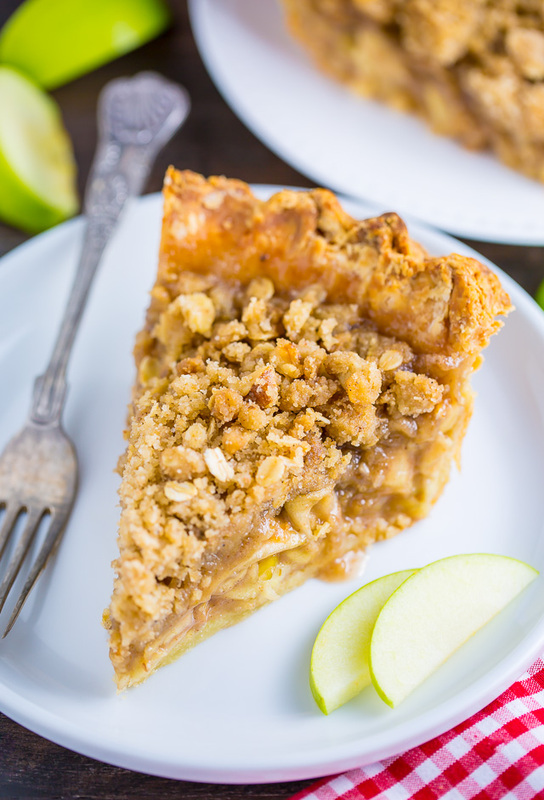 I think I’ll try this again because I did think the crumb topping was very good, but maybe try with your other pie crust recipe and use lemon juice instead of apple cider vinegar and try a different type of apple instead of Granny Smith. Will report back!